In 2017, I completed 29 of 41 goals for a success rate of 71%. This is by far my most successful year since I started recording goals in 2010 and beats my previous five year average of 53% by quite a bit. I had some areas of great success in 2017. 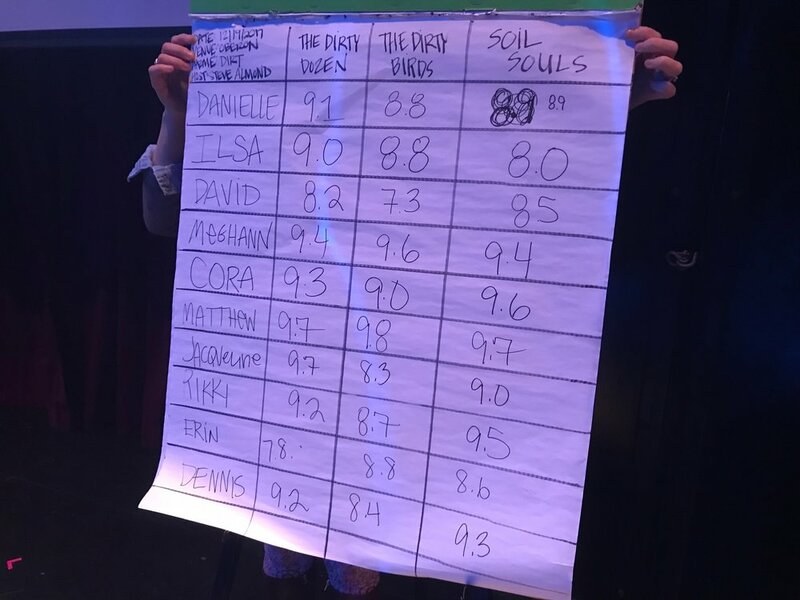 I performed especially well in the areas of writing (10 out of 14 goals completed) and storytelling (6 out of 8 completed). While I'm pleased with the overall results, there were some missed opportunities. My biggest disappointments were my failure to lose 20 pounds, my failure to write a new screenplay, and my failure to launch a new podcast. Those were very doable in 2017. There were also a few pathetic failures. I failed to write a new screenplay. I failed to finalize any details for our Heavy Metal Playhouse 25 year reunion. I didn't cook a single meal for Elysha. These were not difficult goals to achieve or at least get started. I also accomplished half a dozen goals that did not make my initial list but became important as the year progressed. I was paid to perform at venues in Boston, Kansas City, New York, New Hampshire, Maine, and various points throughout Connecticut. I expanded my roster of clients with whom I consult for on screenplays, pilot scripts, pubic speaking, and TED Talks. The roster now includes politicians, university professors, and several entities in the healthcare industry. I taught storytelling and public speaking at Yale University, the University of Connecticut, the University of Hartford, Central CT State University, Northeastern University, Miss Porter's School, The Berkshire School, The Oxford School, and Farmington High School. I also booked three more workshops (including a weeklong workshop) at Kripalu Center for Yoga and Health and another week at Miss Porter's School. I worked with union organizers in Kansas City to help low wage restaurant workers tell their stories and performed a benefit show for them. I taught storytelling to priests, rabbis, ministers, and to the administrators of South Windsor Public Schools. I booked weddings for 2018, extending my DJ career into its 22nd season. I didn't die a single time this year. I can't actually say that for every year of my life. Two more pounds gained in December, bringing total weight loss for the year to 8 pounds. 4. Practice yoga at least three days a week for at least 15 minutes each day. I participated in a full week of yoga while teaching at Kripalu back in August. That was the extent of my yoga experience in 2017. 5. Take the stairs whenever I am ascending or descending five flights or less. 6. Complete my sixth novel before the end of 2017. 7. Complete my first middle grade/YA novel. 8. Write at least three new picture books, including one with a female, non-white protagonist. I launched four picture book projects in 2017 but failed to bring any to completion. A non-fiction picture book about the great Idaho beaver airlift of 1948 (nearly complete). 9. 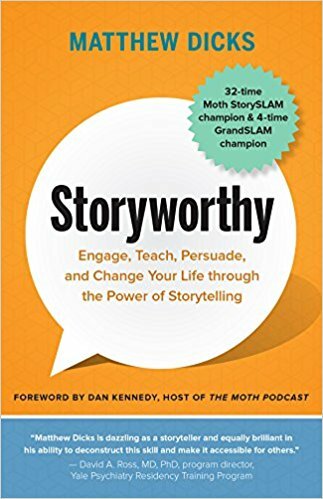 Complete a book on storytelling. It publishes on June 12, 2018. Huzzah! Preorder here. 10. Write a new screenplay. No progress. Extenuating circumstances related to my former film agent admittedly played a role, but this was certainly doable. "Back in the Day" written and produced in June 2017. 12. Submit at least five Op-Ed pieces to The New York Times for consideration. I submitted four pieces to the New York Times Op-Ed page in December, bringing my total submissions to five. Sadly, nothing was accepted for publication. 13. Write a proposal for a nonfiction book related to education. Note-taking completed. Sample chapters being written, but proposal is not complete. Three submitted in December. Awaiting word of possible publication. I spent April praying to God at least once a day. Quite often three or more times per day. As you may know, I'm a reluctant atheist, so I hadn't prayed in a very long time. In October, I followed James Altucher's suggestion about turning the water ice cold for the last few seconds of your shower. It sounds crazy, but science suggests it really might make you more productive for the rest of the day. I spent the month of November speaking to one stranger per day. 16. Increase my author newsletter subscriber base to 1,600. I grew my list by 32 subscribers in December (and 328 overall this year). Total subscribers now stands at 1620. 17. Write at least six letters to my father. I sent my sixth letter to my father a week before Christmas. 18. Convert Greetings Little One into a book. No progress. I was unable to locate someone willing to do the work. I also didn't try hard enough. 19. Record one thing learned every day in 2017. In Silicon Valley, startups that result in a successful exit have an average founding age of 47 years. I also realized that the man who inspired me to engage in this activity records one thing learned each week as opposed to each day. His list, not surprising, is much more interesting than mine and probably less of a chore to complete. 20. Produce a total of 12 Speak Up storytelling events. We produced a show at the Connecticut Historical Society in Hartford in December, bringing our total number of Speak Up events in 2017 to 17. 21. Deliver a TED Talk. I spoke about the important things that teachers do at The Pomfret School in April. 22. Attend at least 15 Moth events with the intention of telling a story. I attended two Moth StorySLAMs in December at Housing Works in Manhattan and Oberon in Cambridge, bringing my yearly total of Moth events to 20. 23. Win at least three Moth StorySLAMs. I won five StorySLAMs in 2017 (including winning one and tying for first in another in December). Three were won in New York and two were won in Boston. My win total now stands at 34. 24. Win a Moth GrandSLAM. I had three chances to compete in a Moth GrandSLAM in 2017 and was unavailable every time. As a result, I was unable to even try to achieve this goal. 25. Produce at least 50 episodes of my new podcast Live Better. I pulled down my first episode after receiving feedback from a friend who works in radio. That same friend has agreed to build me a template for the show. No progress yet. 26. Perform stand up at least once in 2017. I performed a five-minute set at Sea Tea Comedy in downtown Hartford in November. 27. Write a one-person show. The "writing" for this show is complete. I performed the show at Kripalu, altered slightly so I could teach lessons between stories. 28. Explore the option of teaching a college class. I met with three professors at two local colleges and described my proposed class. All approved of my idea, and two promised to pass the information onto their department heads. 29. Cook at least 12 good meals (averaging one per month) in 2017. I cooked no meals in 2017. 30. Plan a 25 year reunion of the Heavy Metal Playhouse. Serious attempts were made to secure a venue, but no luck. 31. I will stand in vocal opposition to every negative comment made about age disparities between male and female romantic couplings because I choose to respect a woman’s choices of romantic partner regardless of their age or the age of their partner. 32. I will report on the content of speech during every locker room experience via social media in 2017. Over the course of the month, I heard no man bragging about sexually assaulting women in any locker rooms (or anywhere else for that matter) and reported on this via social media. 33. I will stop presenting the heteronormative mother-and-father paradigm as the default parental paradigm when speaking to my children and my students. Not as hard as I thought. I switched over to "parents" in January and haven't slipped yet. 34. I will not comment, positively or negatively, about physical appearance of any person save my wife and children, in 2017 in an effort to reduce the focus on physical appearance in our culture overall. Easily accomplished. I've also learned that at least seven other people have adopted this policy, which thrills me. It should be everyone. 35. Surprise Elysha at least six times in 2017. I surprised Elysha with a membership to Winding Trails, a local recreation area that we have been waiting to join for over a year, bringing my total number of surprises to six. 36. Replace the 12 ancient, energy-inefficient windows in our home with new windows that will keep the cold out and actually open in the warmer months. Our windows were cleaned by professionals, but this does not count. 37. Optimize our television for a streaming service. Apple TV and Amazon Prime are alive and well in our home, thanks to Elysha. 38. Set a new personal best in golf. I managed to tie my personal best early in the season. I never came close after that. 39. Play poker at least six times in 2016. A surge in poker in November and December brought my total games played to six. 40. Spend at least six days with my best friend of more than 25 years. Four days spent working as DJ's at weddings. One day spent watching a video of a trip to Florida circa 1993. 41. Post my progress in terms of these resolutions on this blog on the first day of every month.